These Junior Euro Saet breeches are made from a comfortable knitted stretch fabric which is very durable. 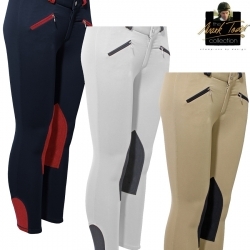 Featuring front zip pockets, co-ordinating coloured knee patches, super stretch ankles, zip and belt loops. The Mark Todd signature is subtly embroidered ensuring a smart, modern look.